The most pessimistic explanation as to why humans seem to be becoming less intelligent is that we have effectively reached our intellectual peak. Between the 1930s and 1980s, the average IQ score in the US rose by three points and in post-war Japan and Denmark, test scores also increased significantly – a trend known as the ‘Flynn effect’. This increase in intelligence was due to improved nutrition and living conditions – as well as better education – says James Flynn of the University of Otago, after whom the effect is named. 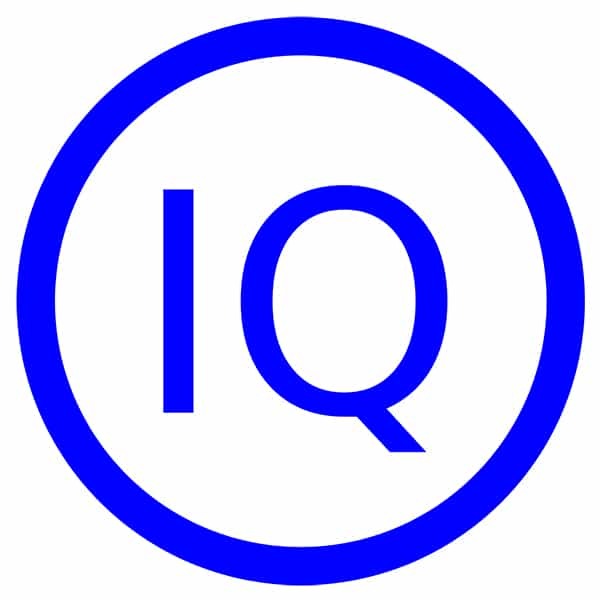 Westerns have lost 14 IQ points on average since the Victorian age, according to a study published by the University of Amsterdam last year. Jan te Nijenhuis thinks this could be because intelligent women tend to have less children than women who are not as clever, The Huffington Post reported.The perceived link between IQ and fertility is a very contentious one. Each study measured peoples’ reaction times – how long they took to press a button after being prompted. It is claimed that reaction time mirrors mental processing speed – so it reflects intelligence. Now some experts believe we are starting to see the end of the Flynn effect in developed countries – and that IQ scores are not just levelling out, but declining. Scientists including Dr Flynn think better education can reverse the trend and point out the perceived decline could just be a blip. However, other scientists are not so optimistic. Using the same data, a different author arrived at a separate conclusion (posted below). We suspect that more is at play other than just the “white factor”. Terrible food (more like poisoned food), water supply that is far from pure, overuse of antibiotics and abusive use of vaccinations, etc. Something to consider; breeders would not take a prized Male stud and mate it with a weak female horse; the chances of producing a winner would be slim. Although the drop in IQ levels was recently presented in the controlled media (and the Daily Mail in particular) as some type of mysterious drop to which no easily-identifiable cause could be attributed, the decreased IQ is obviously the product of mass Third World immigration from countries with much lower IQs. 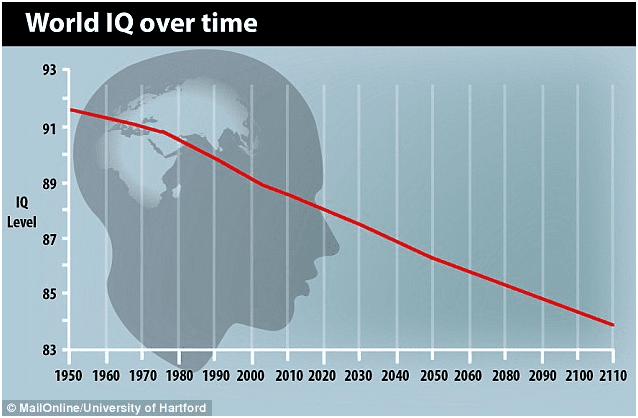 According to the statistics, IQ test results in the UK, Denmark, and Australia have shown a significant decline in the past decade alone, and the average IQ of “Westerners” has plunged 10 points or more since 1900. 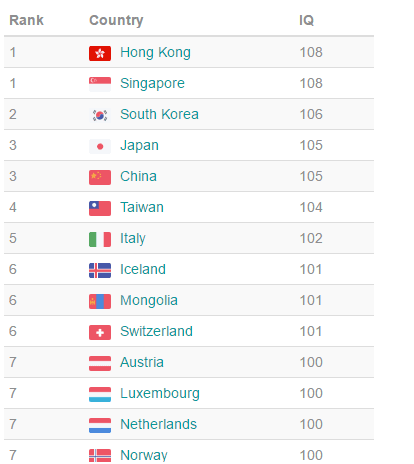 The nations with the highest IQ are all Asian and if you consider that the ethnic population is predominantly Chinese in the top two countries than it would be fair to assume that in general, the Chinese have the Highest IQ as a group. This sort of negates the black and white issue but does not deny the fact that mixing with low IQ individuals could have an adverse impact on long-term IQ of a nation. Having the highest overall IQ does not mean that that nation has all the geniuses. For example, when it comes to computer Hacking, Chinese Hackers cannot compete with Russians. The same applies to top Mathematicians, Physicists, etc. By logic then the best way to dilute the IQ of a nation would be to have high IQ individuals mate with low IQ people. We will not dig deeper into this as this topic is beyond the scope of this publication, but it provides you with some food for thought.